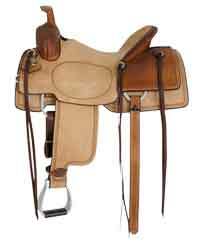 "The Buster Welch style front features a Texas dally horn, trimmed in rawhide. The rough-out hard seat, jockeys and fenders are accented with spider tooling on the fork, cantle, and skirts. The dropped tree rigging and square skirts make this saddle a winner for ranch cutting or working cow horse competitions. Available in seat sizes 15 inch, 15.5 inch and 16 inch."